Making waves once again! Nike returns with the second iteration of their ground-breaking Air Max silhouette – the Air VaporMax 2! With the dust barely settled from the launch of the original VaporMax in 2017, Nike has already pushed the sneak to a new level. The sneaker retains the key aspects of the OG silhouette, with the lack of a midsole allowing for the Air Max unit to be placed directly underfoot to give maximum cushioning and energy return. In addition to this, the Air VaporMax 2 brings fresh design elements that further elevate the trainer. The fresh sneak comes with a native Flyknit upper, providing a snug, sock-like fit and added structural support to the foot. The Flyknit material is also ultra-durable, making it perfect for long-lasting use; whether you’re a keen runner or a street stylin’ sneakerhead. Offering next-level flexibility and breathability, your feet not only look fresh but feel fresh. Looking to provide additional support without taking away from the flexibility of the shoe, Nike has introduced a lightweight overlay to the heel of the trainer. The modified support guarantees a more secure feel that keeps the foot stable – ensuring the heel doesn’t rock from side-to-side, while perforations to the synthetic support keeps the heel ventilated. Innovation doesn’t stop at Nike – the sky is the limit, and the VaporMax 2 will have you walking on Air! 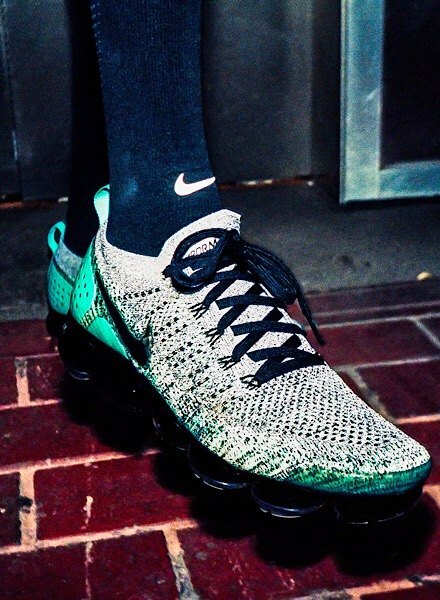 Don’t miss the launch of the Air VaporMax Flyknit 2 in men’s and women’s sizing @ 8am on 22nd March at JD Sports. Check out the fresh colourways and cop a pair before they’re all gone!